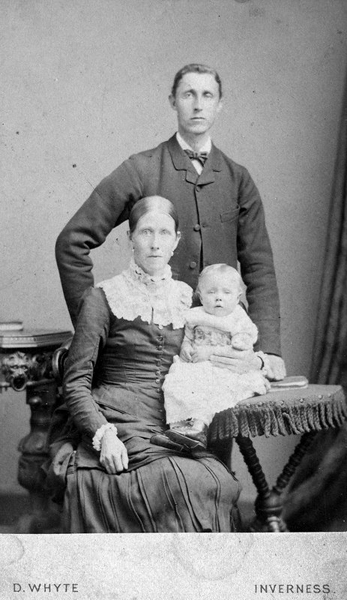 Henry Dunn (back) born August 27, 1855, Inverness, Scotland married Ann Grant (sitting) born June 10, 1858, Creich, Scotland on December 29, 1882 at Nigg, Scotland. Baby is Mary Ann Dunn, born November 22, 1898, Invergordon Scotland. Father: Edward Dunn born 1814 (England) and died on December 2, 1891 in Edinburgh, Scotland. Note: in my research the name Hannah Wilson was used from 1836 to 1881 and once in 1885. Sarah Ryal was used from 1882 to her death in 1893.